You have some great options once again for featured cookbooks full of delicious options to feed your friends and family! 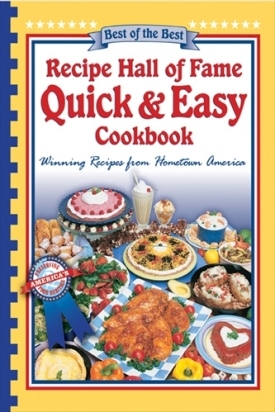 First is Recipe Hall of Fame Quick & Easy Cookbook by Quail Ridge. Fast and easy recipes that are sure to please, what could be better? This book features a 15 minute Alfredo, and lazy man's fried chicken, Asparagus Ham Rolls, or a recipe for Speidini (crusty French bread with bacon and cheese). I loved the Almond Crusted Oven Pancakes. There are so many options from breakfast to dinner and don't forget sweet desserts as well. Have you ever intended to try out one of the recipes that we have featured in the newsletter, but then forgot, or never got around to doing so? Then, you forgot which newsletter it was in, and then never could find it (a year later when you looked). Guess what? Those 2013 Newsletter recipes have been compiled into a Cookbook just for you! A whole year's worth of recipes that have been handpicked by our staff and writers! I don't have a picture for you due to the nature of this cookbook, but I know it is going to be great!